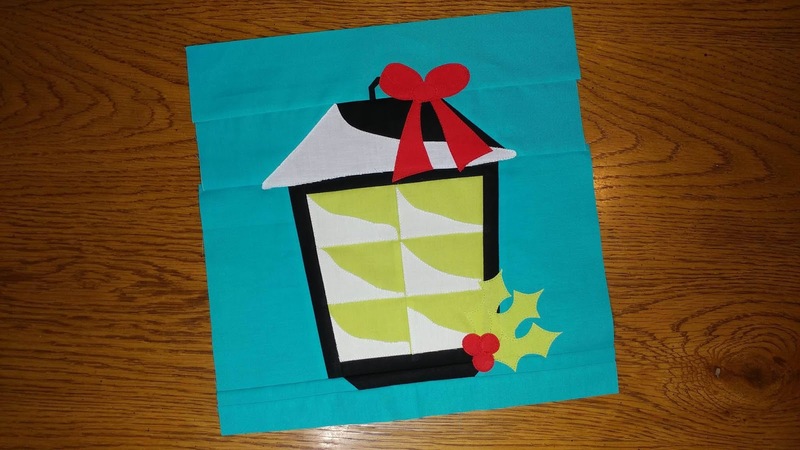 This fortnight's block is a Christmas lantern designed by Diane at Cwilt Fabrics & Haberdashery. You can find the pattern and tutorial for the block on her blog here. 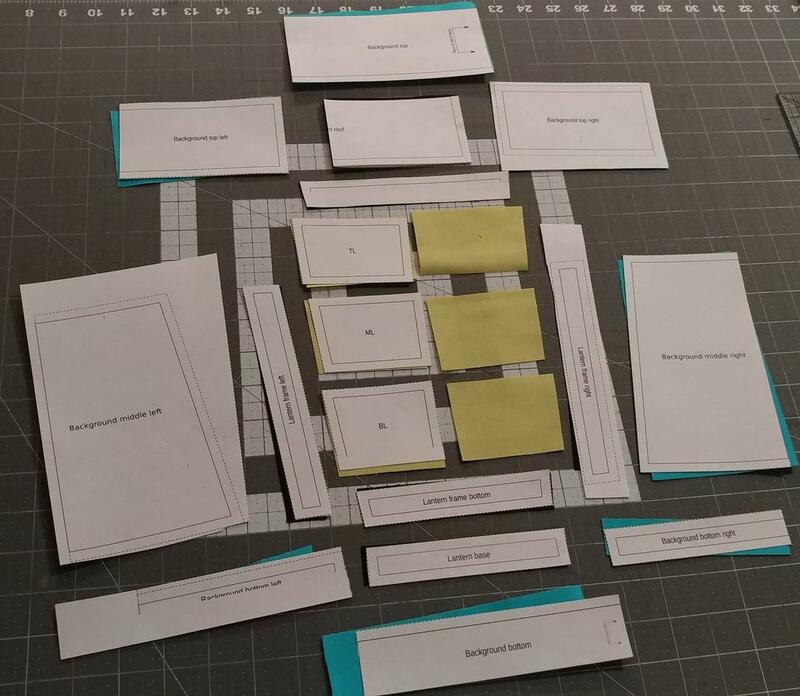 My limited color palette really required some problem solving and planning ahead in order to make this block work! 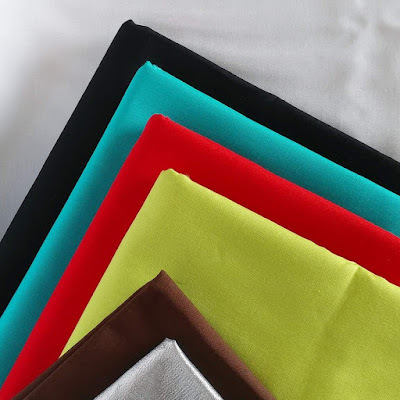 I first decided Moda Bella 98 White would be the snow and Kona Black would be the lantern. After much debate, I finally settled on Kona Breakers for the background, Kona Cactus for the light and holly, and Kona Lipstick for the bow and berries. I'm always game for trying new things, and Diane's block provided an opportunity to do just that! I have never cut my fabric pieces using templates that I then sew together! I'll be honest, I didn't expect the pieces to fit together well, but they did! 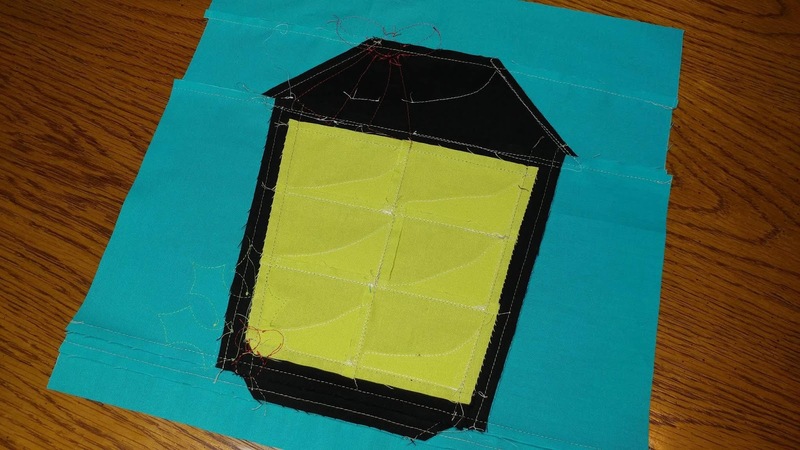 When piecing the top of the lantern, my piece ended up 1/4" too short (so it measured 12 1/4" long instead of 12 1/2"). Once centered, it was only 1/8" short on each end, so I decided to leave it. (Gasp!) Once sewn together with the other blocks, you won't even be able to tell. This was the only snafu I had! For the applique, I used Heat-N-Bond Lite to secure the pieces onto the lantern. Then I stitched each piece down with 50wt Aurifil thread. I used a straight stitch just inside the raw edge of each piece. 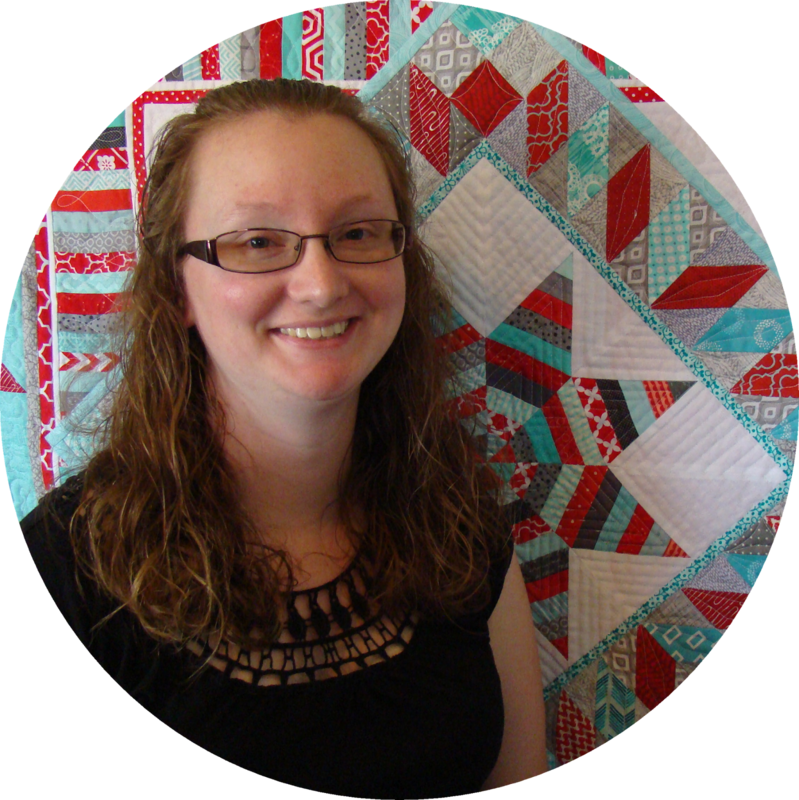 I used Aurifil colors #2250 Red, #5017 Shining Green, #2024 White, and #2692 Black. 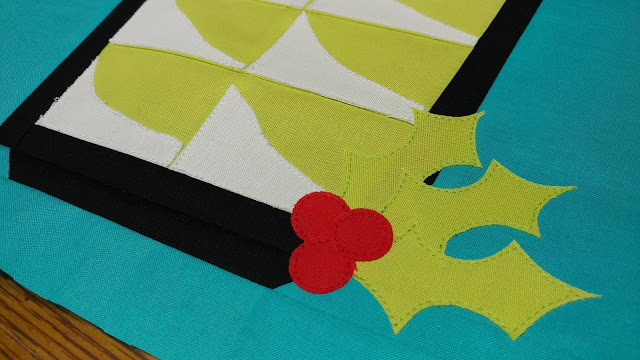 Once the applique pieces were stitched, I used my 12 1/2" acrylic square to trim the block. 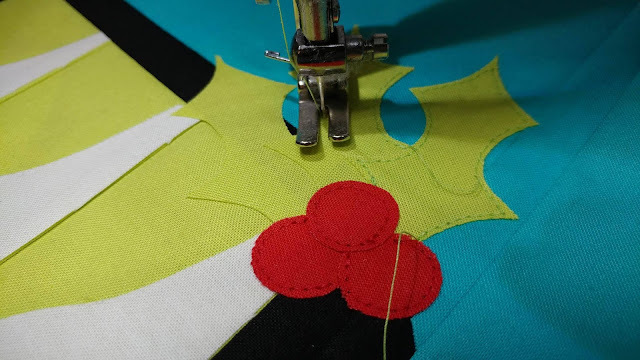 Behind the seams, you can see the stitches for each of the appliqued shapes. Just two more blocks to go! 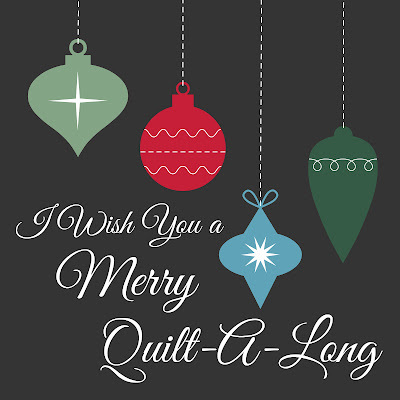 I can hardly believe I'm going to have a Christmas quilt made before Christmas! Be sure to check out the other hosts' versions of this block! They are SO unique! 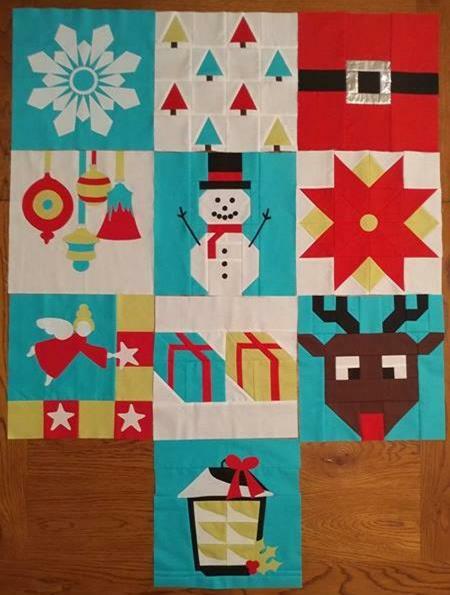 Be sure to share a picture of your finished Christmas Lantern block before November 21st to be entered to win prizes! 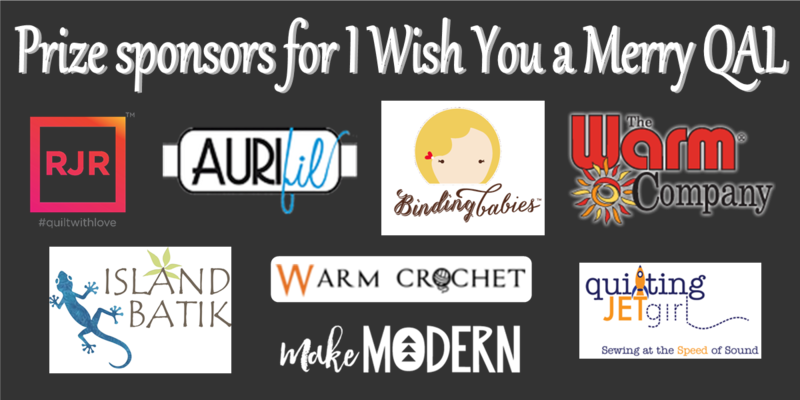 You can post a picture in the Facebook group, on Instagram using #iwishyouamerryqal, or link up to the linky party at the bottom of Diane's tutorial post. The prizes for Block 10 are 2 Steam-A-Seam 2 packages from The Warm Co. and a pdf pattern of your choice from Quilt in Piece! All prizes during the QAL will be open to participants worldwide! 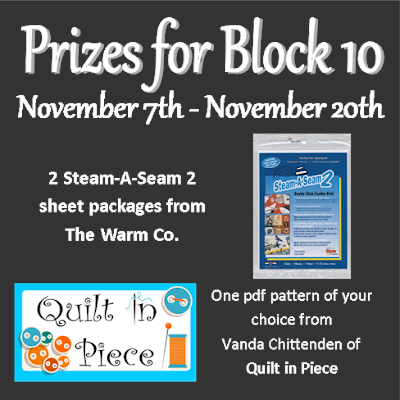 Love your color choices for this block as well as your whole quilt! 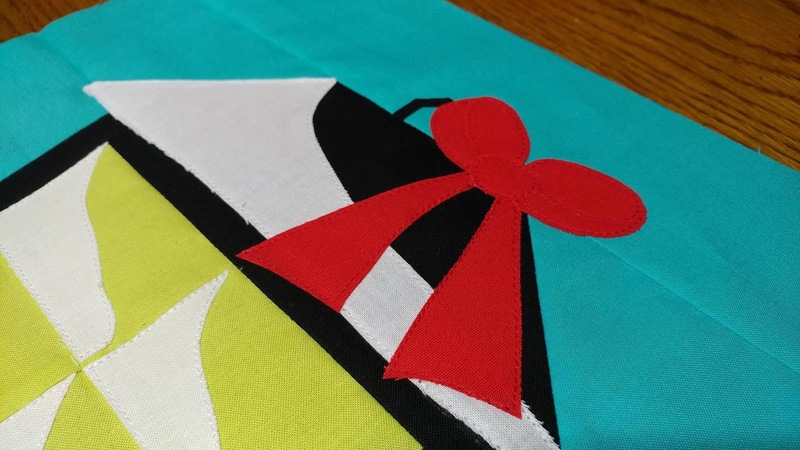 I don't know a lot about raw edge applique although I've done it once on one block in a different quilt when I wanted it to fray and intentionally stitched it a half inch from the edge. Have you found the pieces fray when you stitch close to the edge? 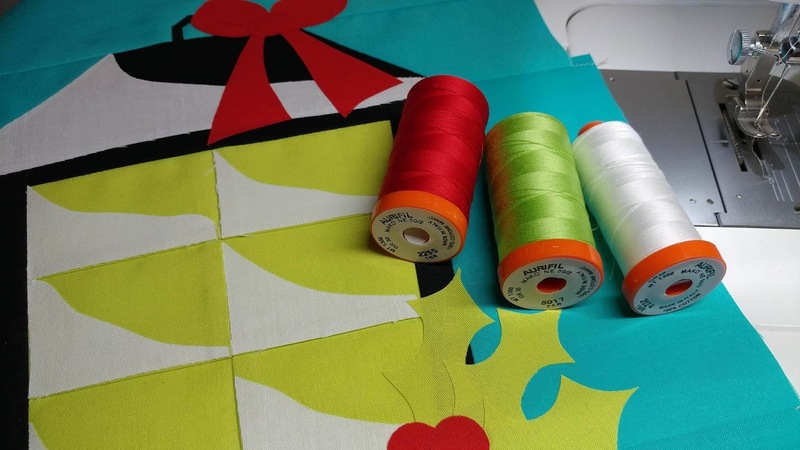 The pieces do fray slightly, just up to the stitching line. After washing, you can trim the loose threads to tame it just a bit. I have heard of others using fray check or fabric Mod Podge to keep the edges from fraying, but I haven't tried those. I really like your block! It's so much fun to see how you're making all of the blocks work with your limited fabrics. I think you were very successful with the problem solving. Your block looks great. You are really on the home stretch now! 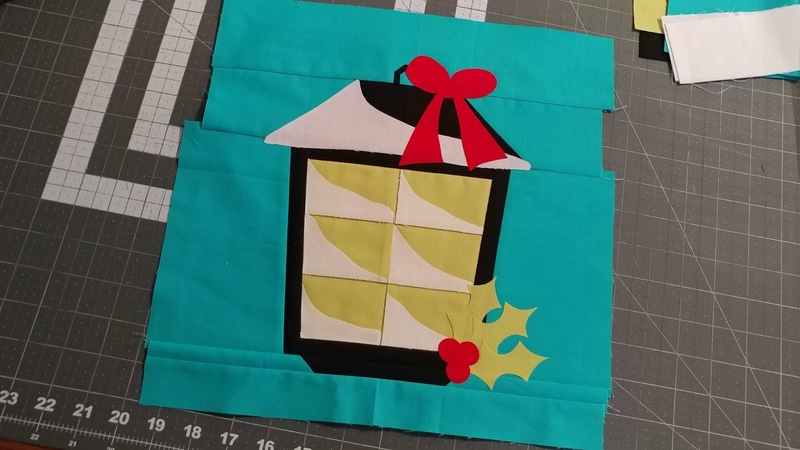 I can't believe how far along the QAL is either! 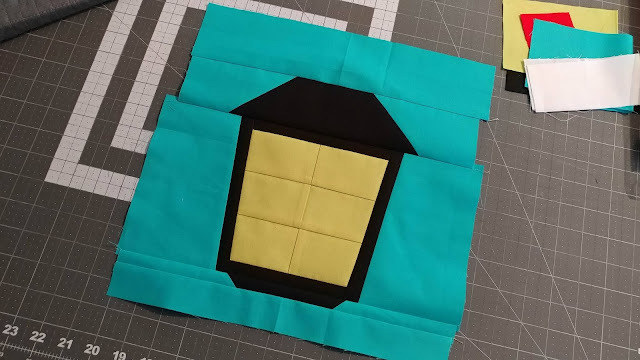 You made the right color choices for your pretty lantern, your quilt is coming together perfectly. Yes! I linked to the pattern in the post; it is on Diane's blog here: http://blog.cwilt.co.uk/2017/11/i-wish-you-merry-quilt-along-block-10.html. 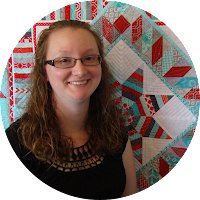 The pdf download of the pattern is on her site; on the second line of her post, click "get the pattern here." i love how the block looks in your bright solids! So awesome!